When we moved to this house, I was over-the-moon excited to have my first real pantry. Why, in only a few months, an antique schoolhouse light could be shining down on homemade pickles and preserves! Neat shelves of glass jars would hold bulk grains, while vintage aprons showcase beauty and utility. I'd clean and organize, then fall back into disorder. Since John's birth, the pantry has been my lost cause. Forget cute--I needed functional solutions. I'm opening the door on my pantry failure because it's ultimately a question of stewardship. Am I making the most of the space I have been given? How much money has this chaos cost my family? Have I let a disheartening area define the way I work? Tomorrow I will share how I'm tackling the problem. You have had a yard sale, made baby food for the freezer, made a meal to share with a couple and organizing (or at least in the planning stage) your pantry this week. Does that mean your in-laws have not arrived yet? You must be really super woman if you are doing all those things, caring for an infant, toddler and young child AND entertaining guests! I am curious how the visit went or is going or when they will arrive. I can't wait to see the pantry when it is finished. I'm sure we can all benefit from some organizational tips from a professional organizer! Has the refinished the floors project been put on hold or has that been going on, too? You must be exhausted! I am - just thinking about it all! Good luck with everything and thanks for the inspiration! Along the thread of your "say yes" idea... I let my 6yo "reorganize" the pantry. It wasn't perfect, but it was workable, and I could find most everything. It wasn't that way when she was done! Meredith, I love it when you show us your big challenges and let us learn as you learn. By coincidence I am working on my utility room this week, I organized when we first moved in but need to re-do to fit how we are really using. I love this room (never had a laundry room before) and use it everything that doesn't fit elsewhere in this little house.The walkway is 20" or less but I have washer, dryer, stand-up freezer and hot water heater on one wall, the other wall is upper cabinets above with the kids' stepstool stored below, the 25 lb bag of rice and boxes of soymilk, changing table, laundry hampers then vacuum, broom & mop. Honestly, this cracked me up. I saw the title in my reader, and thought, "yeah, if I even had a walk-in pantry" because that's something that I literally dream about. Then I saw your picture, and just laughed. Thanks for helping me remember that the grass is not always greener. This will be fun to read when I have the time! Thanks Tanna, too. 1. Start with what really needs to be in there and close to the kitchen. Everything else---out! 2. Section the shelving: baking stuff, canned veggies/sauces, pastas, snackage, cleaning supplies, Health & Beauty. Mark the shelves if you have to (use pictures so your pre-readers can police the neatness if you want). It makes it very easy for me to see immediately if we're out of cream of chicken soup when that spot is empty. 3. A few wire bins that hang from shelves might come in handy for things like aprons, plastic grocery sacks, etc. AND you can hang one under the first if you've only got a bit of width to fit and can't really install wood shelving. Might even consider one of those rolling wire shelves for the baking supplies. Roll it out while baking, roll it back when done. 4. Do consider skinny shelving for the spices, condiments, baking soda kinda stuff for that left wall and only full width shelving for several cans deep of soups or those cereal containers. 5. I don't see a skinny collapsible step stool to enable you to actually reach the things on the top shelves while you're in there. 6. If you can span the space above the water heater to connect wall to wall...do. AND, don't forget the backside of the pantry door. We've got a tall wire shelving unit on the backside of our bathroom door for shampoos, cotton balls, extra deodorant etc. It'd be perfect for all sorts of smaller containers. We JUST tackled this problem ourselves. Here is our before and after - http://sheridans-shenanigans.info/?p=1176. So much happier. And now my DH is making slide out shelves for my kitchen cabinets - what a sweetheart! My pantry is tiny, always seeming to need to be reorganized. 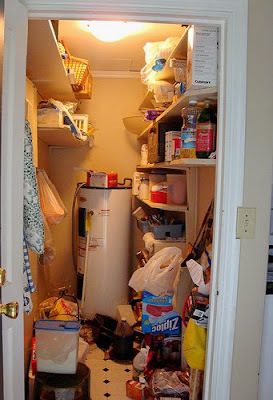 I think we've all been there at some point--if not with the pantry, then with some other room/area of the house! As an self proclaimed organizer. Just one look from the photo, I can see that you need better shelf space. will check out your friends site to see what she suggest. So looking forward to see what you do. Meredith, thank you for sharing this photo of your pantry looking less than the ideal in your mind's eye. We women do have such high standards for ourselves and tend to feel so embarrassed for even our closest friends to see our cluttered closets, messy garages or crowded pantries. But when I peak into your pantry, I don't feel bothered one bit. In fact, knowing how busy your life is caring for your family and ministering to others, I am just amazed at all that you do get done. Yes, you could have reorganized the pantry, but the time and energy that would have taken was probably expended in other worthy pursuits. Of course, along with everyone else, I will be so happy for you when your pantry meets your ideal, and know that it will ultimately make your life easier to have a beautiful, functional space. But I just want you to know that I think it looks beautifully busy right now too. I'll be interested to hear what you do too :) It looks like more shelving could be added and non-food items removed. Doesn't sound like you have the time to be too serious about it, but I catalog my pantry items as well with expiration dates so I can see what's coming due and make sure I use it up in time. Have to admit I'm a bit wistful for a walk-in-pantry. Linked to this on my blog here and made note of the good comments! Thanks! i enjoyed reading your pantry post! i myself like to maintain a lot of order, my daughter on the otherhand likes complete chaos! i cannot stand it! i *just* finished posting on my blog i share with a friend (her and my daughter are kindred spirits!) a blog about my daughter's 'mess' that spreads from her bedroom to the living room to the laundry room of our newly moved into basement suite. then i stumbled upon your own blog! i feel so connected :) my daughter on the other hand is oblivious to the problem and is outside playing instead of tackling her chore. i would love it if you had a chance to take a peek and offer a suggestion or two..... heehee i know you're probably stacked for time.. anyways, i wanted to send you my appreciation of your pantry post. it's a beautiful pantry, and well organized! the baskets are very cute! While I'm always a bit envious over women that actually have pantries, I can easily see mine becoming a huge mess and quickly. I'm loving your organization series, and will definitely refer back to this when we move and I get a pantry. For now, there is very little room for food storage at our house. Thanks for sharing your pantry-in-progress. You've inspired me to tackle mine! Mine's in the basement tucked next to the oil tank. It needs a major cleaning out and brightening up.